Nowadays most self-proclaimed doom metal bands, even some of the old-timers, really don't sound too much different musically than a lot of today's stoner metal or stoner rock bands. 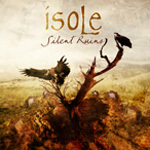 So while it might seem like a dying genre, there are a few bands like Isole out there that are still out there keeping the Swedish doom metal tradition going strong. Their newest album 'Silent Ruins' does exactly that. Since their debut the band has been pumping out material at a ridiculous pace, recording three previous albums between 2005 - 2007. But even while churning out the tunes at that pace Isole always seemed to manage to put something a bit different into each CD. The first few releases were similar to fellow Swedish bands Neurosis and Cult Of Luna combining slow, heavy doom metal with extreme vocals. While there is still the occasional growl, Isole has opted to primarily use clean vocals this time around. The result is more of an epic sound but not one that is any less heavy or doomy. Vocalist Daniel Bryntse has this medieval chant thing going on that really suits Isole's sound well. Song's like 'From The Dark' and 'Forlorn' sound like thy were recorded in some 17th century monastery. How much doomier can you get than that?